Staffing owners and CEO's face non-stop pressure to deliver above-market growth during the best of times. When the economy is weak, that demand grows even stronger. While mergers and acquisitions have the ability to generate growth, the fact remains that consistently beating the market requires more than that. It takes superior internal capabilities, especially in sales and recruiting. Hiring and developing talent is a key component, but in my experience, being a market leader requires a true commitment to leading organizational change. Research from Richardson's 2019 Selling Challenges Research Study highlights the key sales challenges that sales professionals face. They received responses from more than 300 participants. Their research not only highlights the most common challenges faced by sales professionals but illustrates what effective selling looks like in 2019. The prevailing view is that simply possessing sales skill is NOT enough. Instead, sales professionals must be agile; they must possess the ability to quickly read the selling scenario, and understand which skills, behaviors and knowledge are needed at that precise moment and then react and execute accordingly. Moreover, they need the ability to seamlessly transition from one skill to another as they engage with different buyer personas and stakeholders at varying stages of buying cycle. Possessing this "sales agility" is what drives and maintains sales momentum. 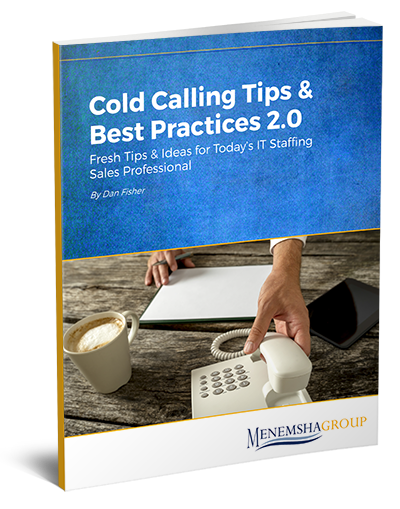 For IT staffing organizations, high recruiter and sales rep turnover isn’t just disruptive—it can be financially devastating and demoralizing. According to a DePaul University study, the average turnover cost per sales rep is $97,690 when you add up recruiting costs, training costs, and lost sales. Let that sink in for a second. If you have a sales and/or recruiting team that churns through five employees in a year, you’ve just let nearly $500,000 go down the drain! To make matters worse, it takes 4 months on average to replace a new sales rep or recruiter. Add on several more months before they are operating at the proficiency of a tenured sales rep or recruiter meeting quota. This is especially alarming when you consider that most sales reps—no matter how happy or successful they are—typically have one foot out the door at all times. A Glassdoor survey found that only 19% of sales reps have no immediate plans to leave their companies. However, 68% plan to look for a new job within the next year, and 45% of sales reps plan to look for a new job within the next three months. There are few professions more transient than sales. So why do recruiters and salespeople change teams so often? And what can your IT staffing organization do to reduce employee turnover and stop your top performers from leaving? Here are four ways to reduce employee turnover. But first, let’s first explore why reps and recruiters-especially top performers- leave their employer. Living under the burden of high expectations and non-stop pressure to produce day in and day out combined with the lure of a better situation elsewhere make it difficult for most sellers and recruiters to stay in one place. Limited career growth opportunities and job boredom are other leading causes of employee turnover for top performers. The constant focus on performance leaves no time for professional growth and development which leaves IT staffing firms struggling to retain employees and create career paths. To take it a step further, most front line staffing and recruiting managers have little or even no experience or professional training in employee development. Having worked as a recruiter or sales rep before being promoted, their singular focus has always been on “making their number.” I’ve worked with hundreds of sales managers and recruiting managers in the staffing industry and what I see is a real epidemic; front line managers need the skills and tools to properly coach and develop their people to increase their value to the organization and create career paths. Poor sales culture drives top talent away more than anything else. High performers want to work with other high performers and they want to be held accountable to high standards. High performers tend to leave their employer when they lose belief in their sales leader and in their company’s ability to execute effectively (AKA, salespeople not believing in their delivery team and/or vice versa). This is a management issue and not the fault of the employee. It also doesn’t take a Harvard MBA to know that top performers will only tolerate so many distractions such as office politics or back-channel communications before they mentally check out and decide to move on. Nothing turns off a high performer more than office bureaucracy. They detest internal politics and unnecessary meetings where the same topics are discussed repeatedly without any decisions. Does this sound like your culture? Finally, many recruiting and sales managers often make the mistake of over-relying on compensation as the only means for retaining their top performers. Money is a weak substitute for effective leadership, professional development and a compelling career path. Compensation doesn’t address deeper needs such as personal fulfillment and job satisfaction. Chances are you’re planning some sort of sales and recruiting effectiveness initiative for the coming months. Perhaps you’re thinking of overhauling your existing new-hire onboarding program, or maybe you have training designed for your sales reps to accelerate the customer interview and hiring process, or candidate negotiation training for your recruiters. Whatever it is, let’s assume for a second that you did the hard work and created a world class training strategy, built engaging training content, and you secured buy-in from the field. Let’s also assume you delivered a compelling learning experience for your employees in which employee feedback was overwhelmingly positive. The most important job for the sales leader is coaching and developing their people. Coaching and continuous learning is the one thing that connects high performing sales teams because sales requires constant practice for one to stay on top of their game. While you may have some individuals who are keen on learning and trying new things and always researching the latest and greatest ideas and best practices, the majority of your salespeople are not going to be this proactive. The majority of your people will need direction and guidance from their sales leader. Sales enablement is the process of providing the sales (and recruiting) organization with the technology, tools, processes, methodologies, training, coaching, playbooks and analytics that help salespeople sell more effectively. The intention of sales enablement is to provide salespeople with what they need in order to consistently engage customers and candidates in productive sales conversations at each stage of the sales process. But regardless of how effective your sales enablement program is, there is one element that FAR OUTWEIGHS all others and determines success or failure, and that is the sales manager.